Abbas tells Israel TV that he turned down flat an offer by Olmert for a state on the equivalent of 99.5% of Judea and Samaria. For the first time, Palestinian Authority (PA) chairman Mahmoud Abbas has admitted that he rejected "out of hand" an Israeli offer for a PA state on nearly 95% of Judea and Samaria. In 2008, then-Israeli Prime Minister Ehud Olmert offered to agree to the creation of an independent PA state including all of Gaza, nearly all of Judea/Samaria, and parts of Israel – a total area equal to 99.5% of the size of Judea and Samaria. In addition, a tunnel would connect Judea/Samaria to Gaza, and the PA state would have its capital in eastern Jerusalem. Not only that: Olmert also agreed to the return of 5,000 Arab refugees from the 1948 War of Independence over five years. 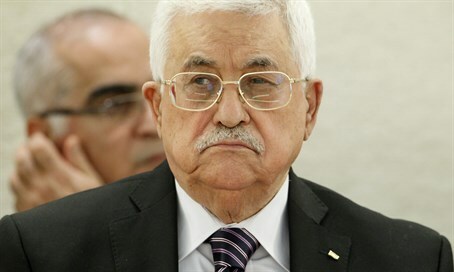 Abbas never publicly admitted that he turned down this offer – until this past week. In an interview on Israel's Channel 10, Abbas said that in September of 2008, Olmert presented him with a map that delineated the borders of the proposed PA state. The Channel 10 interviewer asked, "In the map that Olmert presented you, Israel would annex 6.3 percent [of Judea/Samaria] and compensate the Palestinians with 5.8 percent [taken from pre-1967 Israel]. What did you propose in return?" Abbas replied, "I did not agree ... I rejected it out of hand." Abbas in fact did not initial the map, and the PA never officially responded to the Olmert offer. This jibes with Olmert's report of the meeting. Olmert has said that Abbas said at the time, "I am not in a marketplace or a bazaar. I came to demarcate the borders of Palestine - the June 4, 1967 borders - without detracting a single inch, and without detracting a single stone from Jerusalem, or from the holy Christian and Muslim places. This is why the Palestinian negotiators did not sign." Zionist Organization of America (ZOA) National President Morton A. Klein said, "The ZOA has exposed numerous times the falsity of the claim that Abbas and Fatah, the party he leads, have accepted Israel's legitimacy and permanence. For years, we have been drawing attention to the duplicity of Mahmoud Abbas and Fatah." Klein noted that Abbas has "made it clear that he does not accept a Jewish state [and] insists on the racist policy of excluding all Jews from any future Palestinian state... The PA engages daily in anti-peace, pro-terror acts of incitement, misinformation and propaganda -- it clearly is not seeking a peace settlement with Israel, not even one it intends to break." "Mahmoud Abbas has merely admitted what is -- or should have been -- long known to any informed observer," the ZOA concluded.